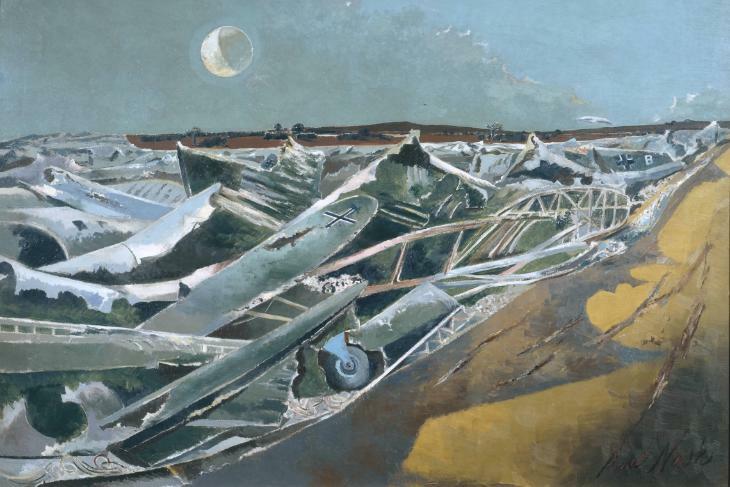 Paul Nash is one of the most distinctive and important British artists of the twentieth century and this is the largest presentation of his work for a generation. Known as a landscape artist, who engaged with the downland and coastal landscapes of southern England and its ancient past, those landscapes also provided a stage for his engagements with an international modernism, specifically Surrealism. The exhibition presents the artist’s major works from his early Symbolist manner, through to the iconic works of the First World War, as well as his landscapes of the interwar period. It also features his involvement with Surrealism and his post-war landscape series engaging with natural cycles such as the phases of the moon. There are oils, watercolours, assemblages and photographs as well as books and archive material. Works are arranged chronologically in themes such as the Symbolist landscapes, war landscapes, coastal scenes, objects, Surrealism, megaliths and cycles of nature. There also features a section on Unit One, the group of British Modernists founded by Nash, which included painters, sculptors and architects active from 1933 to 1935. Unit One toured an influential exhibition in 1934/5, which began at the Mayor Gallery in Cork Street, London and went on tour across the UK. These themes draw out Nash’s concept of ‘unseen landscapes’ and how this enabled him to interpret the British landscape in a way that made connections between modernism and tradition. Writing in Country Life in 1938 he described how a change of perspective or the appreciation of overlooked objects and natural features could allow the viewer to experience familiar landscapes in a new way. Central to Nash’s work was the idea of a life force in inanimate objects ranging from traces of human impact on the landscape such as monoliths and abandoned architectural features to trees, stones and found natural objects. In the 1930s and 1940s Nash’s unusual juxtapositions were manifest in photography, collage, and assemblage as well as painting. His work was particularly close to Eileen Agar’s in these years and objects from the Eileen Agar archive will be shown alongside Nash’s work to show connections between the two.